Lenders may need to raise over 500 bln euros of loss-absorbing capital when investors are fretting over weak growth, rising rates, and geopolitical tensions. Borrowing costs are rising, and even strong banks are scrapping deals. To avert a crunch, the ECB may have to step in. 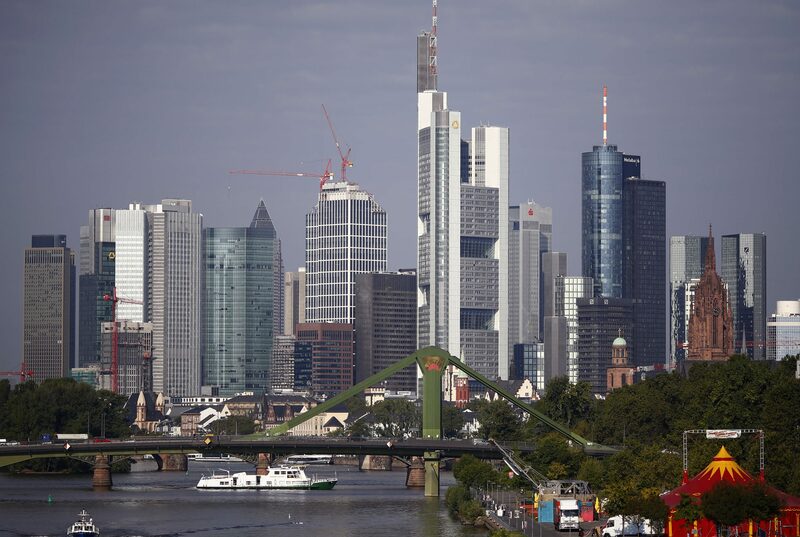 The skyline of Frankfurt with its characteristic bank towers is pictured early morning, August 28, 2013. The European Central Bank is expected to formally end its bond purchase scheme at a meeting on Dec. 13. Since January, the cost of insuring senior unsecured bank debt against default has more than doubled from below 50 basis points to 102 basis points as of Dec. 12, according to the IHS Markit iTraxx Europe Senior Financials index. The credit default swap spread on subordinated bank bonds has also roughly doubled in the same period to 207 basis points. The rising cost of funding forced Dutch lender ING to cancel a US dollar Tier 2 bond on Dec. 3 after failing to gain interest from debt investors. The central bank will publish its monetary policy statement at 1245 GMT on Dec. 13.